Engine # 576 was built by the American Locomotive Company in August 1942, a class J-3, builder #69786. Designed by C.M. Darden, the NC's Chief Mechanical Officer, The J3's were a technological marvel marvel of their day. The one piece cast frame and sealed roller bearings on the engine were revolutionary in reducing maintenance costs for the road. And the lateral motion devices on the lead driver set allowed a much larger, and more powerful, engine to be used on the NC's tight curves. The Whyte system classification for steam engines calls #576 a 4-8-4. Four wheels on the leading trucks, eight drivers, and four wheels on the trailing truck. 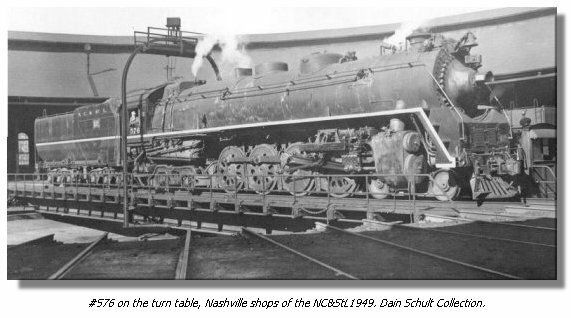 Most railroads called their 4-8-4s "Northerns" after the Northern Pacific Railroad, who first adopted the design. However, the NC&StL went to and from Dixieland, so no "Northerns" would be welcome on the line. Instead, the 4-8-4s were called "Dixies." In practice, the crews called the engines "Yellow Jackets" or "Stripes." When the engines were streamlined, the crews called them "Yellow Jackets" for the broad yellow stripe on their sides. When the wide stripe was removed after the skirts were gone, they were called "Stripes" for the thin line of paint that replaced the wide stripe. NC&StL Preservation Society, Inc. is in no way affiliated with the NC&StL Railway or any of it's successors. As a non-profit entity, NCPS presents these pages to the public purely for educational and historic interest. Please take a moment to send a tax-deductible contribution to NCPS.